The Lednice-Valtice Cultural Landscape (Lednicko-valtický areál) is an area in South Moravia encompassing the village of Lednice and the town of Valtice. Due to the high concentration of architectural monuments and the beauty of the surrounding planned landscape, it was inscribed on UNESCO’s World Heritage List in 1996. The World Heritage Site takes up an area of more or less 200 km², which makes it one of the largest complexes of its kind in Europe. 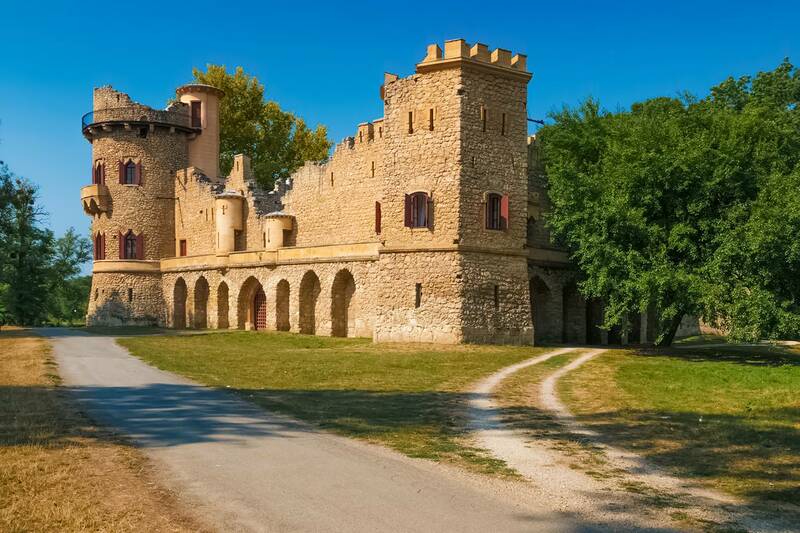 The history of the complex dates to the 13th century, when the House of Liechtenstein acquired a castle in Lednice. It is the same family which rules over the Principality of Liechtenstein. However, it was only in the 17th century that the Liechtensteins started their impressive project of transforming their Moravian properties into a large park. This process was ongoing until the 20th century. The architecture in the Lednice-Valtice Cultural Landscape represents a variety of styles. 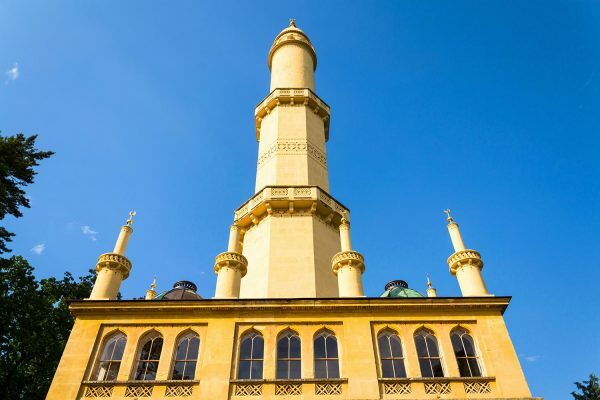 You will find there Baroque, Neo-Classical, Gothic Revival and even Neo-Moorish buildings. After World War II, the park and the buildings were nationalized, and they are owned by the Czech state nowadays. 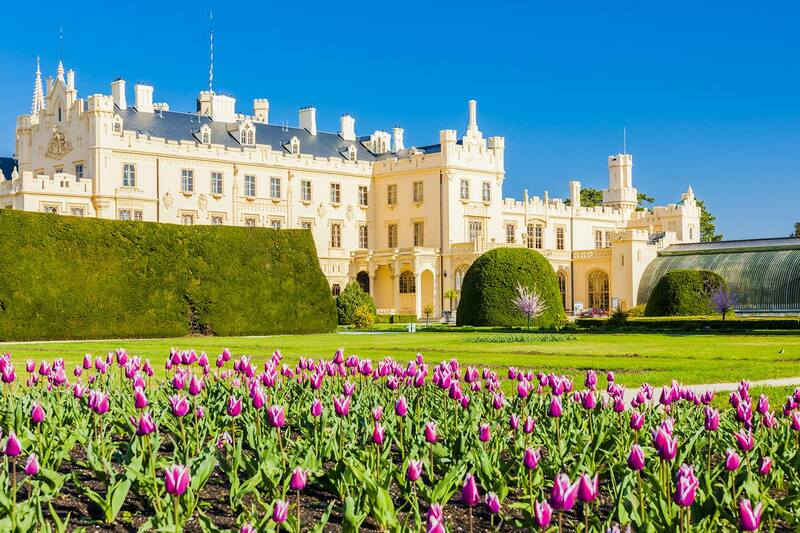 Valtice Chateau is an impressive Baroque residence located not far from the center of this small town. The original Gothic castle from the 13th century that had existed at this site was demolished and replaced with a Renaissance chateau in the 16th century. It didn’t last long, though, because in the 17th century it was also deconstructed, and a Baroque palace was built in its place. Its current appearance it owes to the work of Anton Ospel, Anton Erhard Martinelli and Antonio Beduzzi. It is open to the public and the opening hours can be found here. Lednice Chateau is another gem in the World Heritage Site. Originally, it was a Renaissance residence, later converted into a Baroque palace. 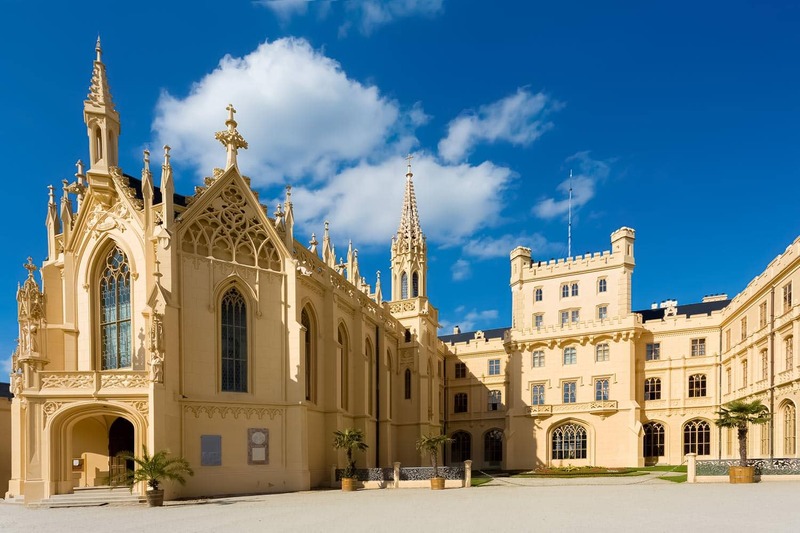 In the mid-19th century, it was remodeled in the Neo-Gothic style by Georg Wingelmüller. It is surrounded by an English landscape garden with a number of Romantic follies. The opening hours of the chateau are here. Rajstna Collonade (sometimes spelled Reistna) is located on a small hill about 1.6 km (1 mi) southwest of the center of Valtice. It is very close to the border with Austria. 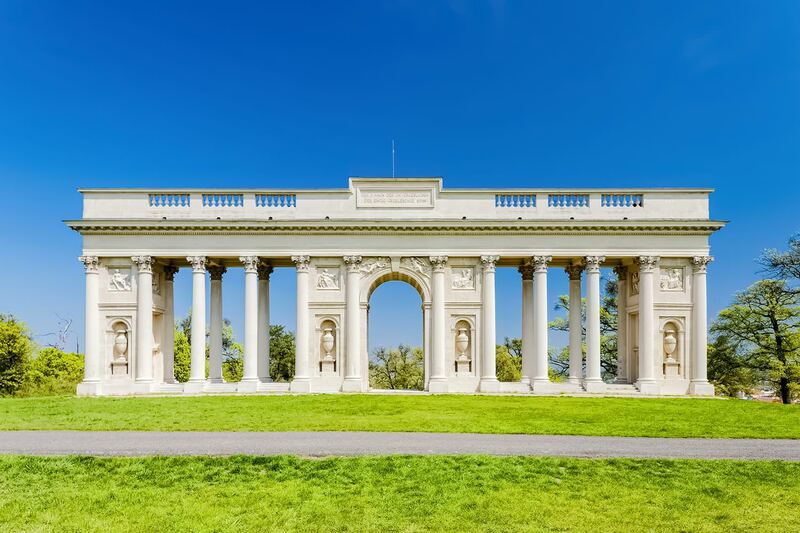 It is a Classicist colonnade designed by Josef Hardtmuth and built in the early 19th century. On top of the colonnade there is an observation deck offering nice views of the surrounding area. From Valtice you can reach it following the red tourist trail. The opening times can be found on the website of Valtice Chateau. John’s Castle (Janův hrad a.k.a. Janohrad) resembles a ruined medieval castle, but it is not because it was destroyed or fell into decay. It was intentionally built this way by the Austrian architect Josef Hardtmuth in the early 19th century. It is located near Lednice Chateau, on the left bank of the river Dyje. 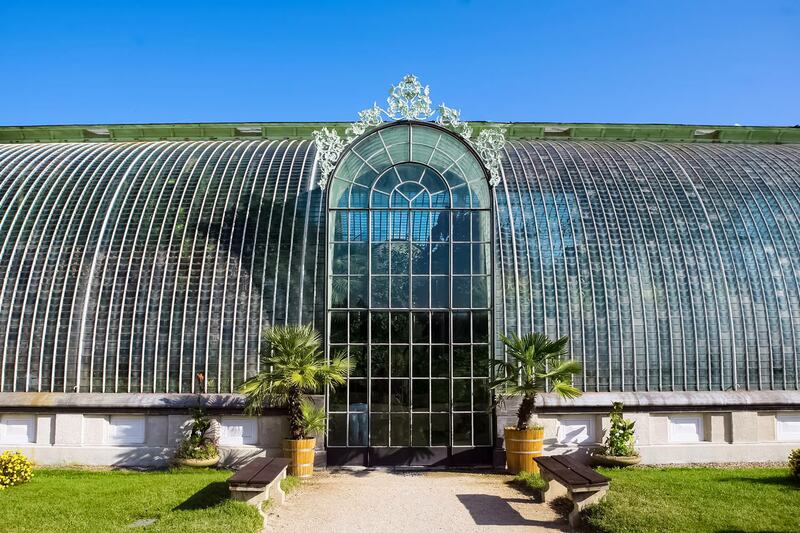 You can get there, for example, following the green tourist trail from Lednice to Břeclav. 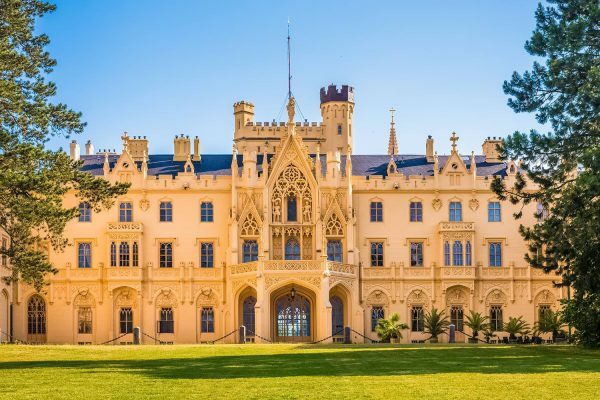 Interestingly, you can also get there by boat from Lednice Chateau. The opening hours can be found on the website of Lednice Chateau. Diana’s Temple (Dianin chrám), located about 3 km northeast of Valtice, is another work of Josef Hardtmuth. It is also known as Rendezvous, just like the nearby pond. As a matter of fact, it is no real temple at all. 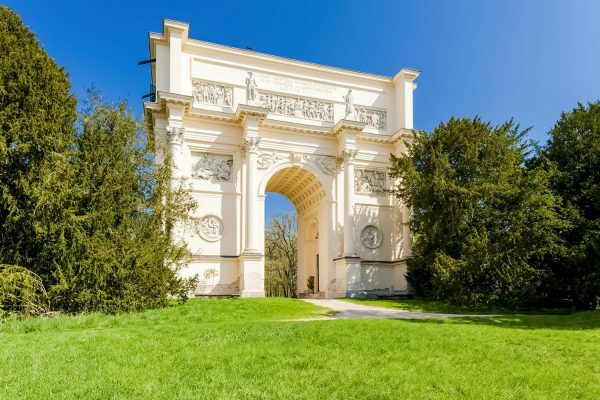 It has the appearance of an ancient triumphal arch, but the Liechtensteins used it as a hunting lodge. Quite eccentric, isn’t it? There is, however, an inscription in Latin dedicating the structure to Diana, the Roman goddess of the hunt. In the high season, it is possible to visit the interiors of Diana’s Temple with a guide. The opening times can be found on the website of Valtice Chateau. The Minaret in the garden of Lednice Chateau is not part of any mosque but serves the role of an observation tower. This 62 m (203 ft) tall Neo-Moorish structure was built by the order of Aloys I, Prince of Liechtenstein at the turn of the 19th century. You can get there on foot or by boat. If you climb the 302 stairs leading to the top and the visibility is good, you may even recognize the tower of St. Stephen’s Cathedral in Vienna on the horizon. Like the nearby Mikulov, the town of Valtice is also a centre of the South Moravian wine culture. 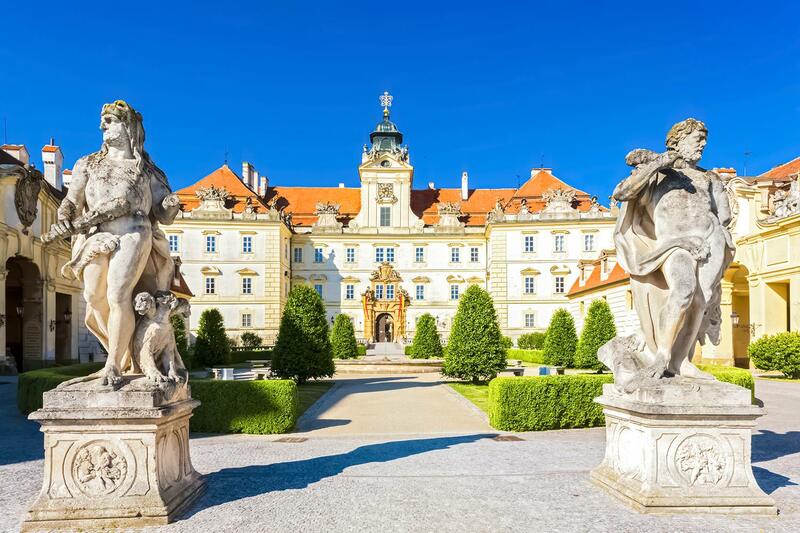 Czechia is world-famous for its beer, but not everybody knows that South Moravia is famous for its wines. There is an annual wine exhibition and competition in Valtice, called Valtické vinné trhy (Valtice Wine Fair). This event is held in May at Valtice Chateau. The Lednice-Valtice Cultural Landscape is a great destination for a day trip if you’re staying, for example, in Brno or the aforementioned Mikulov. Accomodation is available also in Lednice and Valtice, so you may also consider staying overnight there. There is a train station in Valtice, called Valtice město (Valtice – Town). It has direct connections with Břeclav. If you’re coming from Brno, you need to change in Břeclav and board the train going to Valtice město. The journey time is slightly less than 1 hour, some connections are slower and some are faster. If you’re going from Mikulov to Valtice, it is much simpler because there are direct connections. The ride should take only 10-20 minutes, because it is quite close. There is also a train station in Lednice, however it is not used for regular train services. In the high season, there are some tourist trains going from Břeclav to Lednice. At the time of writing, however, these connection do not appear in the regular train timetables. But this is not a problem at all, because you can easily get there by bus. There are frequent bus connections to Lednice from Valtice and other towns. Where to check train and bus timetables online you can find out in this article. Once you arrive in Lednice or Valtice, the best way to get around and see most of the World Heritage Site is by bicycle. Assuming, of course, that you are fit enough to ride it. There are several places renting bicycles in Valtice and Lednice. You can easily find them by typing “Valtice bike rental” or “Lednice bike rental” into your favourite search engine. The rental companies often have multilingual websites, so it is easy to find out the details. Typical costs of renting one bike are around 300 Kč per day, with discounts for longer rentals. The word lednice means also “refrigerator” in Czech. It is derived from led, which means “ice”.